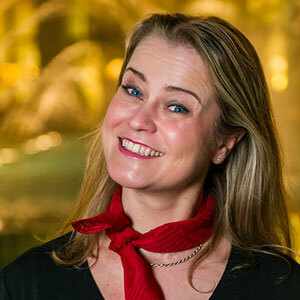 We are very much looking forward to having Merete Haugaa from Hennig-Olsen Is with us as a speaker at the epda Meet & Greet in Paris. Learn here who Merete is and why she will be joining us! What does Hennig-Olsen Is do? Hennig-Olsen Is is the oldest ice cream producer in the Nordic region. We have developed and produced premium quality ice cream based on secret recipes for more than 90 years. Every year we produce approximately 30 million litres of ice cream and frozen desserts at our factory in Hannevika, outside Kristiansand. This accounts for more than half of the Norwegian ice cream market. In addition, we make our own chocolate, caramel, almond brittle and jam. Today, we are about 230 employees from almost 30 different nationalities. In addition to the headquarter in Kristiansand, Hennig-Olsen Is has regional offices in Oslo, Haugesund, Bergen, Molde, Trondheim and Tromsø. What is your position at Hennig-Olsen Is ? At Hennig-Olsen Is I work as a Marketing Manager, and I’m responsible for the visual identity of the mother brand and the corporate identity & communication. I lead our internal team of visual production and the internal editorial board of communication/content board. What is your connection to the design world? Before I started at Hennig-Olsen Is I spent several years within the design industry working for different design agencies in Paris. When arriving at Hennig-Olsen Is in Norway I put this knowledge to use and have run over 90 product and design launches and was in addition just recently responsible for relaunching the visual identity of Hennig-Olsen Is and its implementation on all different platforms and surfaces. During my years at Hennig-Olsen Is I have worked with several Norwegian design agencies, and have had the opportunity to collaborate and sharing thoughts with many great designers and creators. We are people-powered: What does it mean for you and your company (what’s your approach to collaboration)? I believe that you can empower yourself – your company – from within by creating a positive working and sharing culture where People is actually your core value. Realizing and appreciating the knowledge, ideas, experiences and questions of those who are close, can unleash a advantageous power and strength – whether it be in creations, design or other issues. We don’t have to think that the power is “out there” – it’s maybe “right here”! How is your own approach linked to your collaboration with design agencies? In Hennig-Olsen Is we believe that the true power comes from within a group. We use this knowledge in how we work with many issues – not only design. We like to feel that we are part of the “designteams” that we work with, or be part of the “companyteam” that we work for – respecting and encouraging people to bring forward their thoughts on different issues regardless of i.e age or hierarchy. We believe it makes us smarter, gives us smoother processes and our company a better place to work. What is your reason to join us in Paris? I found it very exciting to learn about the organization and this years’ theme. I still feel very close to the “design world” even though I’m at the customer side now, so I am eager to find out more about the challenges the agencies meet with their clients around Europe. I hope we can get some great discussions on how we can enhance all of our work in the future. I will be totally transparent and hope to get the same in return. Why do you believe should designers come an listen to your presentation? I think the combination of having worked several years in design agencies, and just having successfully launched a new visual identity for Hennig-Olsen Is in a somewhat different way might be interesting experience for the discussions at the forum. How do you ensure that a design will be accepted and loved? How do you engage the people working for you to do their very best? How do you create loyalty and trustful relationship with your employees? I believe that Hennig-Olsen Is rather unorthodox methods of the past few years might have some inspiring and interesting cases that can be examples for discussions around the theme “People powered”. What do you think can we learn from each other? Through transparency and sharing of experiences I believe that maybe some agencies might consider changing their view on how they value their teams and team members, how they set their teams and what they actually want to sell their clients and potential new employees. Do you have any questions for us designers? I do have many, but generally I would like to hear what you think are the most challenging parts working with brand owners of today. What are the most difficult instants in a collaboration? What is it that you try to sell that’s unique for you? Is it volatile or sturdy? I have many more questions, and I’m really looking forward to meet you all in Paris in November!